While Namibia’s property industry is booming and the commercial sector seems to be fairly saturated, there is a shortage of housing in virtually all price categories, says Pierre Hollander, head of sales and marketing for the Omeya Golf Estate development, 30km South of Windhoek on the B1 route beneath the Auas mountains. At present, in Windhoek, townhouses average around N$ 2 million and houses are in the N$3,2 to N$3,3 million range. When compared to South Africa (the exchange rate is one for one, i.e. one Namibian dollar equals one SA rand), this might seem quite expensive, yet there is no shortage of buyers, says Hollander. “The marketing analytics provided by RED-i’s Sales information Management system, which is being used at Omeya, shows that potential buyers viewing the interactive sales map (development explorer) spend on average just over seven minutes viewing the properties and features on the estate which indicates serious interest,” said Andrew Kumm, the sales and marketing director for Red-i. Omeya provides South Africans looking to diversify their property portfolio outside of the borders with an opportunity to invest in a stable and familiar environment, said Kumm. With Windhoek a simple two hour flight away from Cape Town, it will also be relatively easy to keep a finger on the pulse of their investment, he said. Of the 367 erven released, 220 have been transferred to buyers to date. There are 17 families who are living at Omeya at present, by mid-2013 there will be 60 families living here and 100 by the end of this year, he said. There are 60 plots left in phases one and two left for sale.The Omeya development was launched just over two years ago by developer Andre van der Walt, who has said that this estate has everything to offer not only the golfer, but the whole family. Omeya, which is 260ha in size, has a Peter Matkovich designed golf course which maximises the African outdoor experience. It is more than a golf estate though, says Hollander. Omeya will have its own pre and primary school, which is currently being built and they expect intake to begin in January 2014. The school has been designed by Leon Barnard Architects and will be run by Windhoek Gymnasium (a well known private school body in Windhoek). When complete, this estate will have a wellness centre, gymnasium, its own hospital, conference centre, boutique hotel and a shopping “village”. 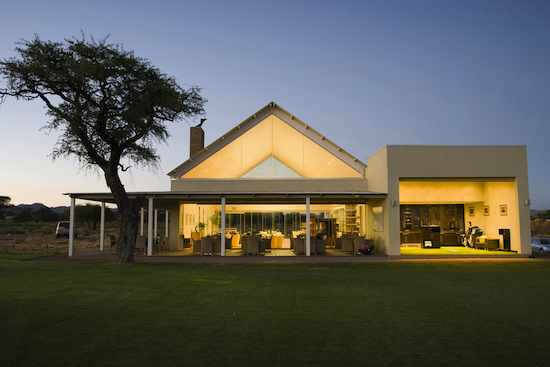 At Omeya erven are priced from N$ 580 000 to N$ 2,8 million (including transfer costs to a natural person). They range from 514m² to a very generous 3 699m² in size and buyers are able to use their own architect and builders to build their homes. There are strict architectural guidelines in place and buyers can choose from 17 house plans that have already been drawn up. Homes are in a modern farmhouse style and the design standards will ensure that no home will be built that does not fit in with the size and aesthetic criteria. optic ring to which they will connect wi-fi transmitters throughout the estate. This will ensure that no matter where residents or visitors are on the estate, there will be connectivity. Unlimited bandwidth will be included in the monthly levies. This fibre optic circle on the estate also enables Omeya to have state of the art Flir security cameras installed in the next phase of security planning. These high end heat sensitive cameras will feed images back to the central control room, pinpointing areas that may have been breached. “This is country living at its best with all the advantages of a first class golf course and all the amenities of modern living. Residents here will never tire of the lush green of the golf course or the wild expanses of the Namibian bushveld with the mountains in the background,” said Kumm.